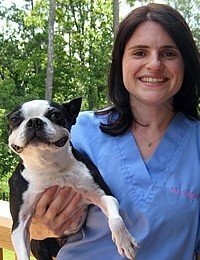 When she was eight years old, Dr. Lisa Wright’s family dog was hospitalized right here at the Animal Hospital of Sandy Springs. Dr. Wright recalls that the dog would only eat when she came to visit her. At that moment, Dr. Wright realized the true importance of the bond between pets and their owners, and wanted to do whatever she could to nurture it! As a full-time veterinarian and the Co-Owner of the hospital, she’s able to help animals and have an impact on the families that love them every single day. Dr. Wright is a native of Sandy Springs and attended Emory University to study economics. After her junior year, she decided to follow her heart and began taking the necessary pre-requisite courses for an education in veterinary medicine. She attended veterinary school at the University of Georgia, graduating with her Doctorate of Veterinary Medicine in 2008. She started here at the clinic right out of veterinary school, then became Co-Owner in June of 2015. In her spare time, Dr. Wright enjoys reading and going to Lake Lanier to spend time with her friends and family. She lives with her husband, Tyler, their son and daughter, and a Boston terrier named Joely who insists on being the center of attention at all times.